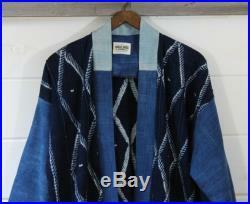 Fabric:we used a vintage african mud cloth shibori blanket to create this one of a kind kimono. 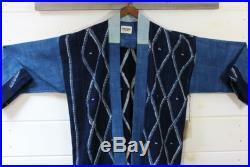 We used three different blankets to create this special piece. 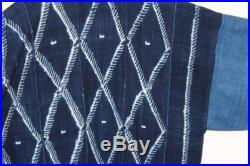 The fabric is a rich deep indigo color with an amazing shibori diamond pattern. 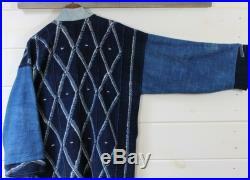 The sleeves and band are made using solid indigo mud cloth fabric. 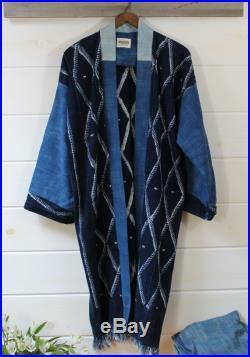 This is a long duster length kimono and is one size fits all and fits many body types and sizes. 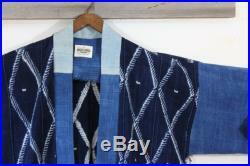 It has a drop shoulder and wide sleeve like a traditional kimono. 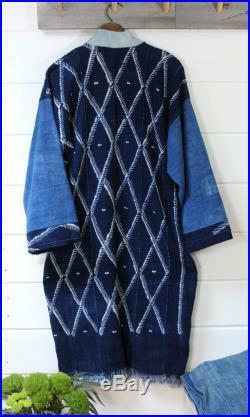 The indigo fabrics are in amazing condition and have a beautiful range of indigo blues throughout the kimono. 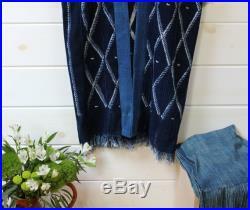 Measurements:bodylength: 45"chest: 49"sleeve length: 32care:wash in cold water with like colors on gentle cycle, hang dry or tumble dry low and iron if needed.